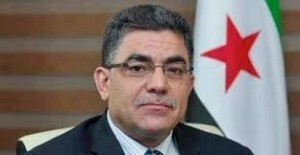 Syria’s rebel interim prime minister Ghassan Hitto announced his resignation in Istanbul on Monday during a meeting of the Syrian main opposition . “I announce I will not continue in my capacity as prime minister tasked with leading the interim government, though I emphasise I will continue working for the interests of the revolution and towards achieving its objectives,” Hitto said in an online statement. According to his biography, Damascus, Syria-born Hitto received B.S. degrees in computer science and mathematics from Indiana University-Purdue University at Indianapolis in 1989; he received an MBA from Indiana Wesleyan University in 1994. Hitto who was backed by Qatar was elected as the interim prime minister last March but failed to form a government . His resignation comes two days after Ahmad Assi Jarba was elected as the new president of the Syrian National Coalition. Jarba who was backed by Saudi Arabia defeated the Qatar backed candidate. It is not clear whther he resigned due to Qatar’s reduced influence within the Syrian opposition . The people with brains get involved, want to ‘do good’, look around for a bit and listen to all the ‘information’ coming at them …. then head for the doors. Too many ‘religionists’ to deal with.